The JLC is confronted by the Justice League. Bat-Man's tech is quickly handled and the two Leagues finally meet. 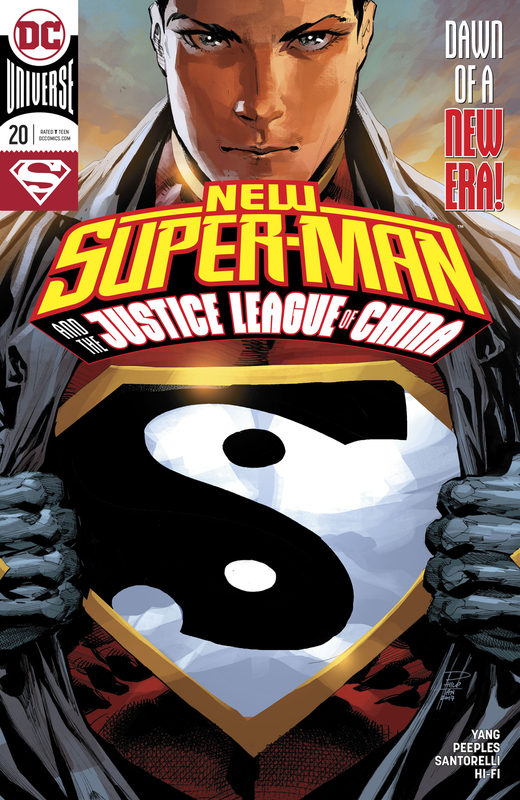 Kenan fills Superman in on the Red Jade Dragon situation while the other Leaguers exchange pleasantries. 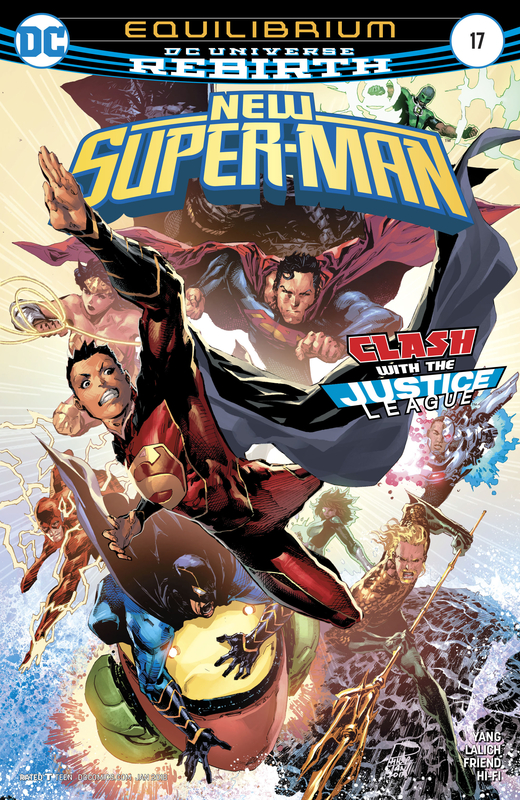 While the rest of the League members clean up the damage to Metropolis, the Supermen and Robinbot search for the Red Jade Dragon. Using Robinbot's technology, the two Supermen find the object in no time. The object rests in a mansion. Kenan is prepared to break in, only to be confronted by Lex Luthor. Disregarding laws against breaking and entering, Kenan forces his way into Lex's place. Kenan finds the Red Jade Dragon and unlocks his powers when the All-Yang arrives. Still against becoming Emperor, Kenan attacks and the two battle briefly before All-Yang reveals that he killed I-Ching. Outside, a magic force field surrounds the mansion. When Kenan accessed his powers, he activated the Red Jade Dragon, which acts as a portal to the realm of the demigods. Lex, Superman, and Robinbot are still trapped in the forcefield outside of Luthor's mansion. Lex suits up and attempts to punch through the shield before a demigod bursts through the roof of his mansion. The forcefield vanishes as Superman flies Lex to safety. 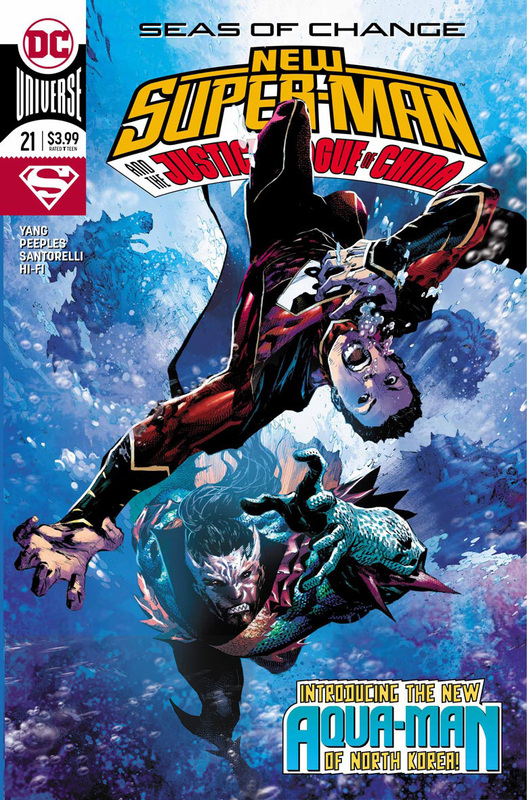 Kenan works to take down the Asura as Superman returns to help. Ice breath seems to work in weakening the demigod, but when Superman tries, the Man of Steel's power is turned against him. Unfazed by their attacks, an army of three demigods make their way to the heart of Metropolis led by All-Yang. The JLC and the Justice League engage in a battle against the Asura. None of their attacks seem to be working. Remembering the words of Master I-Ching, Kenan has Baixi cover for him so he can meditate. As Kenan enters the space in between what is and what is not, he discovers that I-Ching is truly dead. The spirit of I-Ching tells Kenan the story of two brothers who were polar opposites of each other - the physical embodiments of yin and yang. One day, they were instructed to master a bit of each other's ways. While one brother agreed, the other refused vehemently. Master I-Ching reveals that he and All-Yang were the two brothers. Because his brother refused to complete his training, it fell to I-Ching to embody both yin and yang. I-Ching passes the mantle on to Kenan. This causes Kenan's symbol to change. Kenan's meditation is disrupted as Baixi prevents him from being killed. With his new knowledge and completely unlocked abilities, Kenan figures out how to stop the Asura attack. Because he is the embodiment of yin and yang, super and man, he should be able to tap into one side of himself momentarily. As he taps into his human side, the portal opened by the red jade dragon closes. With the portal closed the Leagues are able to take down the Asura. All-Yang appears to a weakened Kenan. 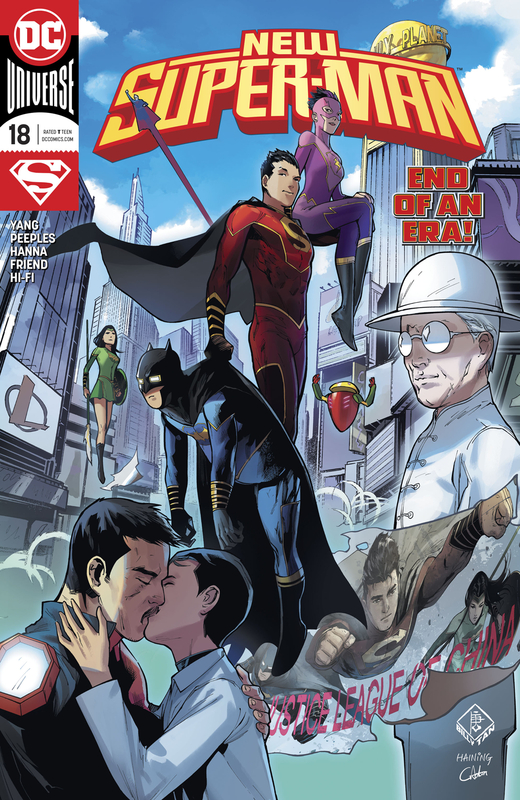 Before Kenan is hit by a blast of All-Yang's heat vision, Superman zips in to shield the young hero. All-Yang's blast weakens Superman as Kenan gets his second wind. 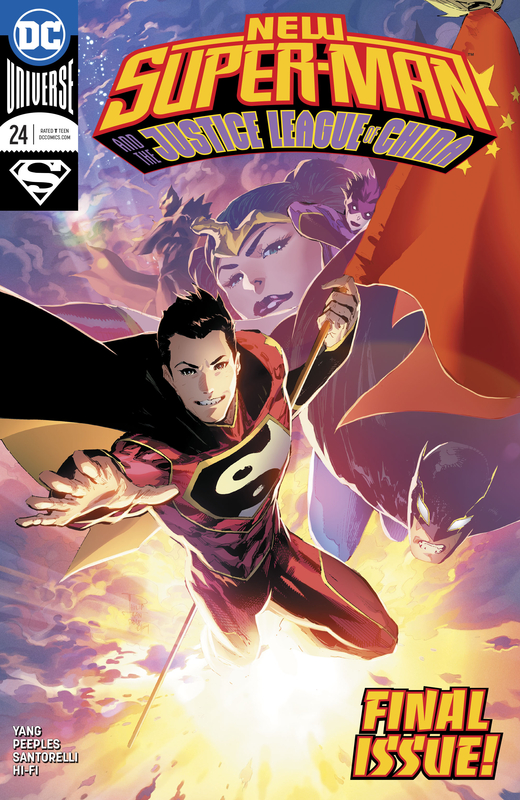 Super-Man tells All-Yang that he is not an enemy, but instead an alternate part of him. This causes All-Yang to be absorbed into Kenan's chest. With the JLC back in China, Kenan confronts his parents. He and the rest of the JLC are leaving the Ministry of Self-Reliance. Dr. Omen is furious, but is powerless to stop her son as Baixi tampered with any means of her stopping him. Zhongdan wants Kenan and his friends to join his cause, but Kenan refuses. As Kenan leaves, a trio of Ministry manufactured Green Lanterns arrive. "Day in the Life of a Shanghai Reporter"
Six weeks after Super-Man's first public appearance, Laney Lan works to report on stories that matter. Her primary interest is in the Justice League of China and Dr. Omen. Based on an anonymous tip, Laney possesses the knowledge that Dr. Omen is Kenan's real mother. While interviewing Kenan, she refuses to break the news to him. At the new JLC headquarters, Kenan meditates. His meditation is abruptly ended as Avery interrupts to ask when they can go to the snow festival. Avery had a chance to go earlier with Deilan and Baixi, but since they began dating, they've become nauseatingly cutesy. Over at the snow festival, Baixi and Deilan discover a being in a panda bear suit sucking energy from children. Deilan removes the panda mask to discover Sleez - an Apocalyptian being who feeds on desires. Elsewhere at North Korea's Rajin University of Marine Transport, a student by the name of Ahn Kwang-Jo is taken into custody by government officials. Kwang-Jo begins sweating profusely as he is escorted out of the lecture hall. Kenan and Avery are summoned and the team jumps into action. Sleez begins absorbing Kenan's desires, but is quickly knocked out by a punch unlike Kenan has ever thrown. 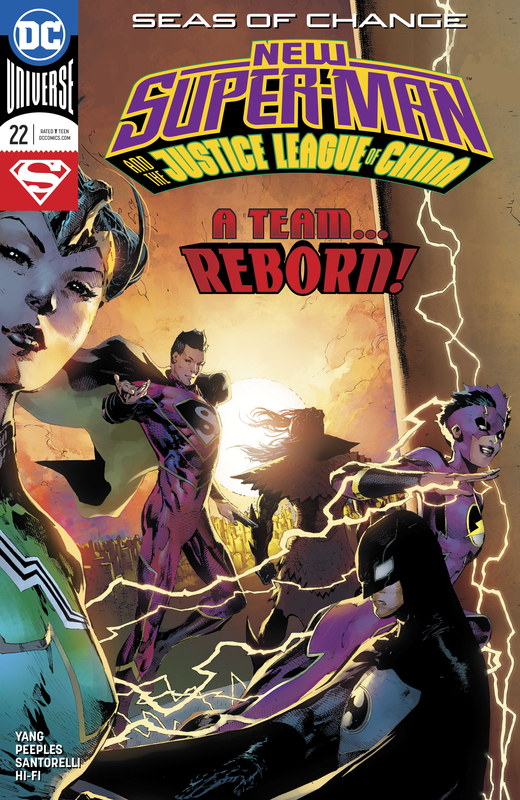 As soon as Sleez is subdued, the Lantern Corps of China arrives to take Sleez and the JLC into custody. At a classified location, Kwang-Jo is interrogated by the government officials, about a television capable of receiving transmissions from across North Korea's border - something which is apparently a serious offense. Kwang-Jo admits to using the television to watch The Simpsons before he is brutally beaten. As he is beaten, water pours out of his body and begins to cover the floor. Back at the snow festival, the Lantern Corp of China prepares to take in the JLC. An emerald construct surrounds Avery, but is quickly destroyed by Kenan. The two share an unplanned kiss before the team flees. In the interrogation room, a giant crustacean begins to emerge from the water produced by Kwang-Jo. With the team back at JLC HQ, Robinbot informs Kenan that Sleez has the ability to inflame desires. Kenan returns to his meditation spot where he enters the space between what is and what is not. Master I-Ching tells Kenan that he is afraid of All-Yang as Kenan's powers are now tied to his emotions. Now more than every, it is imperative that Kenan remain in control. Avery once again interrupts to inform Super-Man that there is a new mission. Kenan and Avery discuss the kiss before Avery accidentally reveals her feelings for her teammate. The team reaches Hunchun - a city on the border of China and North Korea. There, they find two giant monster crabs making their way to China's border. Kenan prepares to engage the giant crabs, but before he can land a punch, Deilan stops him. The giant crabs speak to her and ask her to watch over their liege Kwang-Jo. The Deilan and Kenan comply and the team heads back to the Chinese border. They are then confronted by a general who claims Kwang-Jo is an enemy of the state and a murderer. Baixi votes to hand Kwang-Jo over, but the rest of the team votes against him. A battle begins between the North Korean armed forces and the JLC. Kwang-Jo regains consciousness and rushes off into the line of fire convinced he must die. Kenan and Avery stop a barrage of bullets, except one which nicks Kwang-Jo's face near one of his eyes. The team rushes off to give the boy medical attention. At the Ministry of Self-Reliance's headquarters, Dr. Omen learns of the JLC's possession of Kwang-Jo and plots to interfere. Elsewhere, Kwang-Jo reawakens and is greeted by Deilan who brings him a North Korean soup which, according to Kwang-Jo is only eaten by people who deserve it. Deilan tells him that she got the food at the market. The two go to the market where Kwang-Jo sees the differences between Chinese and North Korean culture. Meanwhile at the JLC headquarters, Kenan and Avery engage in a private moment when they hear an intruder. The intruder is none other than Mingming who has come to warn Kenan that Kwang-Jo must be surrendered immediately. Kenan and Avery refuse. Elsewhere, an army of sea creatures carry bones into Kwang-Jo's temporary room at the JLC headquarters. Kenan meditates to find an answer to the dilemma surrounding Kwang-Jo, but is unable to find a solid answer. In Kwang-Jo's room, he is awakened by King Munmu, the great dragon king of the eastern sea. Munmu claims to be Kwang-Jo's father and orders him to take what is left of his body and gain true power. Kwang-Jo complies and is transformed into The Dragonson. Baixi and Deilan discuss a course of action in dealing with Kwang-Jo before he, as The Dragonson, attacks. 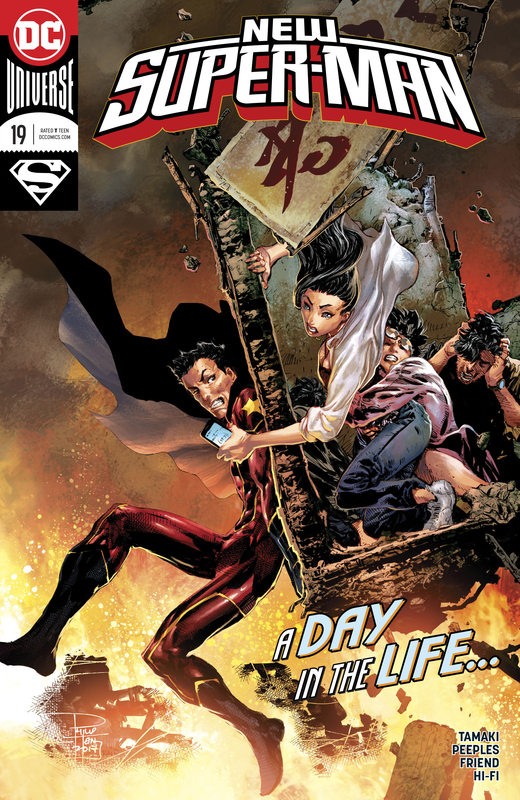 Super-Man and Avery arrive to lend a hand as the Chinese Lantern Corps make an appearance thanks to a call put out by Baixi. The Dragonson has dropped his sword and reverts back to his human form. Deilan and Avery rush off to save Kwang-Jo, with Super-Man joining soon after. The Lanterns hit Kenan with a kryptonite ray, but Kenan resists, releasing a burst of energy which leaves him glowing white. Baixi attempts to rescue Kwang-Jo before they're both captured by the Corps and taken to different locations. Avery, Deilan, and Kenan rush off to rescue them. Before they leave, Avery grabs the bone that transforms Kwang-Jo into The Dragonson. In The Crab Shell prison, Baixi finds himself in a cell with Anathema - essentially a discount Bane. Anathema is choked out from behind. Baixi is horrified to discover that the person responsible for taking down Anathema is Alpaca, Baixi's twisted younger sister. Meanwhile, Kwang-Jo sits in a bubble construct as he is transported to Pyongyang. Telepathically, his father communicates with him about his mission to Paektu Mountain. There, Kwang-Jo is to open the heavenly floodgates and drown every man, woman, and child who pledges loyalty to North Korea's leadership. Not far behind, Kenan and Avery follow the Lanterns that have Kwang-Jo. Kenan reveals that he's reached a new stage of enlightenment that he's been working on reaching for months. Kenan also reveals that the solution to the entire problem is to kill Kwang-Jo. Kwang-Jo is delivered to Pyongyang. Government officials and Dr. Omen circle around the newly captured youth before Kenan and Avery burst in. Determined to kill Kwang-Jo, Kenan goes to unleash a blast of heat vision. Fortunately for Kwang-Jo, Avery had throne the bone to him, transforming Kwang-Jo once again into The Dragonson. Wasting no time, he makes his escape and heads for Paektu Mountain and unleashes the heavenly floodgate. North Korea begins flooding as a result of Dragonson opening the heavenly floodgate. Suddenly, Kwang-Jo has a change of heart, realizing that everyone he loves will perish. 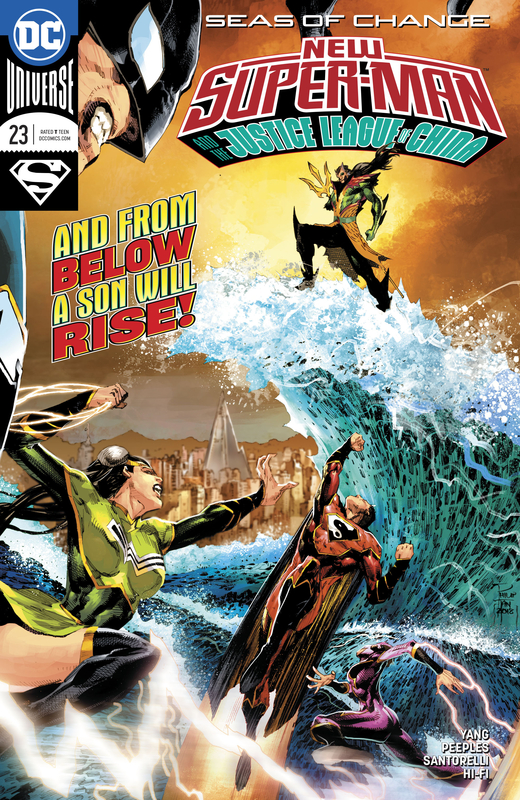 As Kwang-Jo turns against King Munmu, Kenan arrives followed by Avery and the faux Green Lantern Corps. The Lanterns trap Kenan in a box construct as Avery tries to pull Kenan out of his yang-fueled rage. Successful in returning Kenan to normal, the Lanterns begin their journey to take Kenan to the Crab Shell Prison. At the Crab Shel Prison, Alpaca and Baixi break out. Despite their differing viewpoints, Baixi wants talk to his sister. That moment, Deilan and Robinbot arrive to rescue Baixi and head off to assist in North Korea. Back at Prektu Mountain, the North Korean military arrives on the scene and opens fire on Kwang-Jo. The heavenly floodgates are completely open and the nation begins to drown. The JLC springs into action as Avery searches for a way to free Kwang-Jo. Kenan gets the idea to tap into his yin side, which transforms him into a ghost-like entity. After phasing through the box construct, he makes quick work of the Lanterns. Finally free, Kwang-Jo is able to seal the floodgates after realizing that he is in control of the water. The flood flows into Kwang-Jo's body and the crisis ends. With everything wrapped up, Kwang-Jo takes residence with the JLC. Baixi meets his sister in secret to enlist her help and hands her a flash drive with info about a family he saved in the flood. It is revealed that Kwang-Jo produced a water statue of himself to sit in prison, allowing the real Kwang-Jo to have his freedom. In the space between what is and what isn't, Kenan comes to the conclusion that he could visit the realm of spirits in his yin state and makes plans to visit Master I-Ching. The JLC is enjoying an evening free of superhero duties. Baixi and Deilan make amends after Baixi's slight betrayal in the previous arc. Kenan goes to meditate and declares that he will bring Master I-Ching back from the realm of ghosts by embracing his yin. Upon embodying yin, he and the JLC discover that they have been transported to the realm of ghosts. When Kenan tries to return things to normal, he finds that he cannot. The only thing to have changed is that Kenan is no longer a spirit. Kenan encounters the spirit of himself before he became Super-Man, back when he was a bully. The realm of ghosts is not only where the spirits of the dead reside, but also the spirits of past regrets and the fears of what people may become. At this point, dark future versions of the JLC appear and engage in battle with the current JLC members. Kenan finds his future self who fancies himself a god. Hearing his cries, Master I-Ching arrives and defeats Kenan's future self. Kenan expresses regret for entering the realm of ghosts. I-Ching explains that Kenan should focus on letting go of the good that can never be and embracing the good that is. After a brief meditation session, Kenan and the JLC return to the realm of the living, ready to take on whatever threat may come their way.